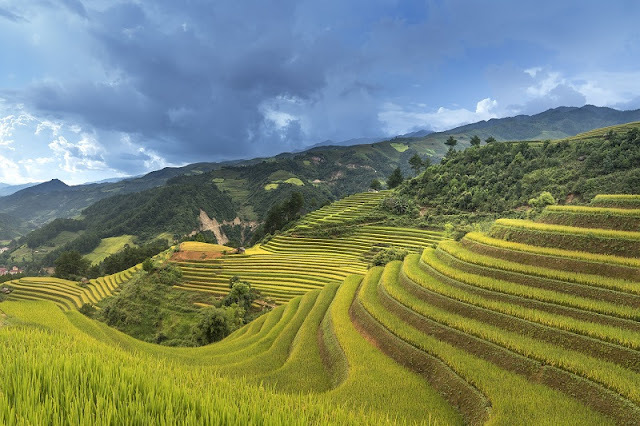 Where are the best rice terraces in Vietnam? Rice terrace, the magical buzzword for every landscape photographer in Vietnam during autumn. But hey, hopeless people like us can enjoy it too. Majestic stairs of rice plants contouring mountains plunge the eyes into a thick blanket of grandiosity. In Vietnam’s Mu Cang Chai and Hoang Su Phi, that blanket proves to be the thickest of all. A Google search will deliver countless photos of rice terraces from northwest to northeast Vietnam. The most beautiful, however, are the ones in Mu Cang Chai and Hoang Su Phi, and it’s according to me. They are all both far enough from Hanoi to take you at least 2 days, or more if you’re into photography, to explore. When best to visit them? Both have a small window of 3 weeks from late September to early October where rice is ripe, hence bringing up a yellow flourishing touch for the otherwise dejected mountains. It’s a rural district in the westernmost part of Yen Bai, a province of northwest Vietnam. Too many west and north? Good news here: the terraces are in the centre of the district. Mu Cang Chai hosts Khau Pha, one of the most feared mountain pass of the country. Driving past Khau Pha and you’ll be drown in rice terrace straight away. Where are its best rice terraces? Rice terrace in Mu Cang Chai is awarded national heritage status a few years ago. The provincial government then invested quite some quids to turn the district into a major tourist attraction (in theory, by Vietnamese standard, of course). The result is a nicely developing Mu Cang Chai town and extraordinarily good national roads (Khau Pha pass included). Your best bet is rent a motorbike or a motor-taxi at the town and head towards the three communes most remembered by its rice fields: La Pan Tan, De Xu Phinh, and Che Cu Nha. All of them are east of the main town, on the side of the QL32. You cannot miss them unless you choose to do so. The most acclaimed of them, La Pan Tan, throws up a place called Mam Xoi viewpoint, with a perfectly flat top layer of rice. Officially, you need to buy a VND20,000 (less than $1) ticket to get inside. And that’s not all, you’ll have a 2-km slope to walk to Mam Xoi terrace. Fortunately, an assemblage of local bike-taxi drivers are they to offer you a ride for VND50,000 for 2 ways. They are the only ones allowed to drive up; your own bike will be stopped outside by the guards. Guess what you have after reaching there? What else if not rice terrace! No I’m just kidding. There you have the most accessible terrace in the region as you descend. It’s the top of a hill linking to other hills, all embed with rice. The wide landscape of rice terrace surrounded by mountain range from far almost makes my eyebrows fail to lower. Its splendor overwhelms all my previous knowledge of agricultural beauty. Try walking down the fields and talking to the landlords (they speak neither English nor Vietnamese), although the view down there is not necessarily better. Just one thing: on a sunny weekend, the crowd may let you down. Keep driving the QL32 and you’ll find Che Cu Nha and De Xu Phinh terrace. They are less accessible though. But I always maintain that watching from far gives me more dazzling scenes. Another option is to drive further to the east, past the top of Khau Pha pass, to paragliding point, which serves as a stop on the pass. You can fly paraglide to the valley below during autumn, provided that you register beforehand. From here, the pretty view covers less rice terrace and flatter paddies prevails. The mightiness remains nevertheless. Local people are of Thai and Hmong ethnicities, mostly having substandard living. They are known for making wine from jujube, as well as producing green rice flake, a Vietnamese nosh. This is a large rural district at the west of Ha Giang, a northeastern province well-celebrated for bombastic mountainscape and sharp winding mountain turns, though more so in its eastern part. Rice in Hoang Su Phi is ripe at least one week later than Mu Cang Chai’s. Farmers often finish harvesting in mid October. Personally I rate Hoang Su Phi at the top of this beauty contest, if there is any. It’s purely beyond imagination, considering we’re living in reality. An unimaginable reality of extravagant man-made marvel, or rice terrace for short. Unlike Mu Cang Chai, rice terrace in Hoang Su Phi stretches on a bigger radius from the town. The most visited are in communes called Ban Phung, Ban Luoc, San Sa Ho, Nam Ty, Thong Nguyen, Ban Peo (counterclockwise order with the town in centre). Among them, Ban Phung possesses the most scenic and largest rice terraces. It’s 30km northwest of town, reachable via a concrete mountain road often damaged during heavy rain (and damaged under normal condition too). Half of this 2-hour drive gives you a breathtaking picture of terrace, mostly far away but some are cultivated right on the roadside. The density of rice field, and its terribly steep profile, generate a much sensational landscape. By the way, Hoang Su Phi’s steepness is considered a distinction, making it standout in the country. The best viewpoint is around Ban Phung commune centre. This area has much higher altitude than Vinh Quang town (after 30km of upward slope, you get the idea), and so the valley where its residents plant rice is just terribly deep as well. The terraces are just big, long, sprout in every mountain. My verdict: 10/10 in terms of beauty. Ban Luoc and San Sa Ho are two adjacent communes 12km southwest of town. Its last 5km on the way to reach the best viewpoint is poorly maintained, with some parts unpaved. But don’t let that disappoint you, since the valley there is so tightly bound with rice terrace like a thousand stairs to heaven. I just felt speechless the first time I was there to see these vivid saffron yellow fields, embellished with green patches, dominate my vista. The other communes stay on the DT177, further from Ban Luoc to the southeast, on the way back to Ha Giang city. They are less accessible if you start from the town but their illustriousness competes well with the abovementioned. If anything, they justify the status of Hoang Su Phi as the greatest of rice terrace host in the country. Thanks to its difficult transport , Hoang Su Phi generally sees less travelers than many other mountain hotspots in north Vietnam. You may feel less annoyed by the crowd, since very few tours are offered there. I believe that’s its strength at avoiding over-tourism at the moment. The district is home to prominent ethnic Dao, La Chi, Hmong, Co Lao, Tay, and Nung minorities, among others. In such a diversified region, rice terrace (and its sister, corn terrace) is something of a convergence. The photos below were taken during Hoang Su Phi tourism festival in Ban Luoc, where local ethnic Dao Ao Dai people played traditional game. 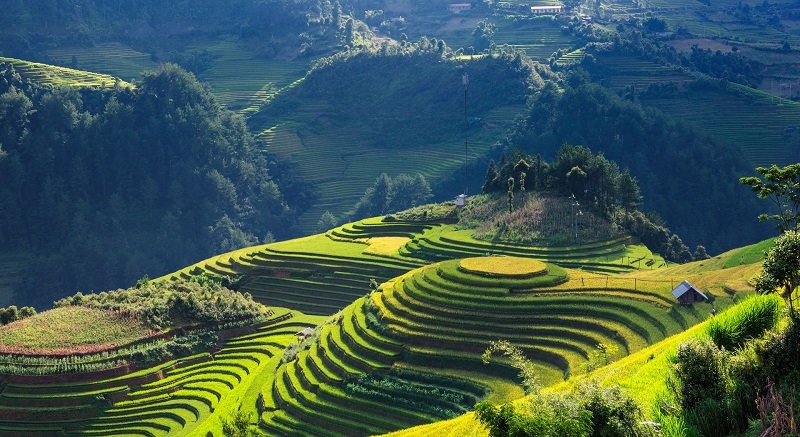 For travelers who prefer some adventure rides combined with crazy mountain view, rice terraces in Mu Cang Chai and Hoang Su Phi offer exactly what you want. They are even not ruined by tourism yet (almost! ), and local stakeholders are doing their part in promoting sustainable tourism, especially community-based model. In this way, there’s another aspect you may expect for your travel: cultural immersion with ethnic minorities. Alternatively, you can easily reach rice terrace in Sapa, a resort district of Lao Cai province, neighbouring both Yen Bai and Lao Cai. Transportation in Sapa is much more tourist-friendly, and its capital town is geared towards tourism completely.